Because of your support, clients are learning how to shop on a budget, read nutrition labels, and make healthy lifestyle choices. A food bank delivers food, right? Then why is Clark County Food Bank meeting clients at the grocery store? 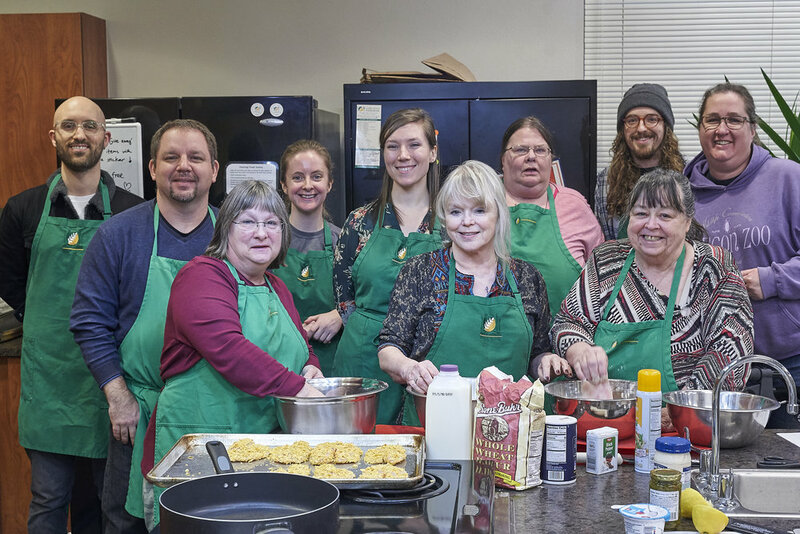 It’s all part of our cooking and shopping program that teaches clients how to make a grocery budget, read nutrition labels, and shop for healthy foods on a budget. These 6-week classes, called “Cooking Matters” begin in the classroom with nutrition instruction. Then they move into the kitchen for hands-on training and cooking demonstrations. And at the end of the 6-week program, the class takes a field trip to a local grocery store to learn practical tips and tricks on how to buy the healthiest food for the least amount of money. These Nutrition Education classes are the critical link to addressing the root causes of hunger in Clark County. At the end of the hour-long tour, clients are given a $10 gift card and encouraged to go purchase all the necessary ingredients for a well-balanced meal. Clients are taught how to carefully examine and compare food labels and nutrition facts during the Cooking Matters Grocery Store Tour. Participants of a recent Cooking Matters course, proudly prepare their “graduation meal” during their last class session together. Thanks to supporters like you, over 3,000 clients experienced real life change through these Nutrition Education classes this past year. Thank you for making Clark County a better, healthier community for all.